"Phillip and Taos Sunrise Builders do amazing work. They do everything from the design and architecture to building, inside & out and even the interior design work." 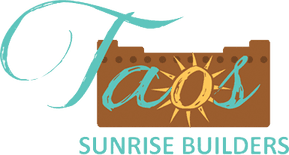 "Taos Sunrise Builders have done two very special projects for me. The first was a walled in garden and fountain. I worked with Phillip Gentry on design and he was able to come up with exactly what I wanted. His crew is very knowledgeable and they are excellent craftsmen. The second project was a garden shed. The combination of Phillip's design skills and his crews excellent workmanship made this another dream come true for me." "Needed to expand our house so we could remodel and enlarge the kitchen. Toas Sunrise Builders were the only contractor in town to get back with us within a few days of coming up with ideas. Added new living room, laundry room and huge porch in the backyard. Definitely having TSB redo the kitchen this fall."